The wait is finally over! A few long nights spent crafting our next graphic t-shirt has paid off. We have fashioned a new, horror franchise film inspired design that any scary movie-lover will adore. Working late into the night, this graphic t-shirt design was inspired by iconic horror movies. 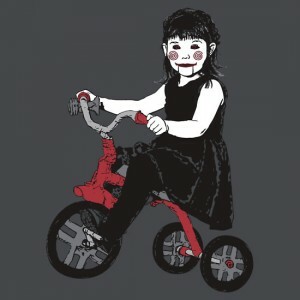 Best to share the love of all things scary by creating a new graphic t-shirt that is recognizable while having a unique Nocturnal Prototype twist. Why not celebrate scary movie night every chance you get? Whether your flavor is the well-known slasher flicks or the paranormal jump out of your seat films; the Saw Girl Puppet graphic t-shirt would be an awesome addition to your wardrobe. As always, you can customize this genuinely eerie graphic t-shirt with a variety of colors and styles.